Personality: She has repeatedly shown a devious, strategic, quite intelligent mindset, and isn't above scheming, play-acting, misdirection or completely ruthless behavior to advance her position towards the object of her affection. That said, she doesn't mind having fun by making severe trouble for him in the meantime. She has stated variations on 'obstacle is for killing' as a personal philosophy of expediency, and has enthusiastically attempted to hold true to this towards Akane, Ukyo, and presumably anyone else she'd suspect of getting too close to her declared airen. Shampoo is very strong, agile and acrobatic. Having been trained in the martial art techniques of the Joketsuzoku since birth, with Cologne as her personal instructor, she is an excellent armed or unarmed fighter, and commonly uses a pair of 'chúi' (solid metal spheres on the ends of handles) as her main weapons. However, she has also been shown using sword, spear, bow, and a variety of pole-arms. Beyond basic fighting ability, Shampoo has displayed knowledge of ventriloquism/voice imitation, shiatsu-induced unconsciousness, mind-control or memory loss, sleep-fighting, intuitive multi-step strategy, defence against enchanted herbs, Chinese cooking, and incredible tracking-skills enabling her to hunt Ranma from rural China to the east of Japan. She also has access to minor magic equipment, and is capable of using her bike to literally bounce across the city. Her true strength may lie in sheer versatility. Hissatsu Shiatsuken (This is an attack in which she uses a specially devised herbal shampoo in conjunction with a shiatsu massage technique involving pressure points on the head to erase her opponent's memories. The process takes at most 6 seconds. History (4 lines): Soon after being cursed at Jusenkyo, Ranma (as a girl) and Genma (as a panda) drop into a contest in a village of the Joketsuzoku. Half-starved, they feed on the next available food-stuff - the feast that was to be the first prize for the contest - and are instantly challenged by Shampoo, the village champion. He swiftly defeats her, but this was a bad move. According to Chinese Amazon tribal laws, if a female Amazon is defeated by a female outsider, she must give the outsider the "Kiss of Death," hunt her down to the ends of the Earth, and kill her (as Ranma tells Akane, "and when they say 'to the ends of Earth', they mean it"). Ranma and Genma manage to elude her and settle down in Nerima, thinking that they've lost her. However, Shampoo eventually tracks female Ranma down and resumes her attempts at murder. 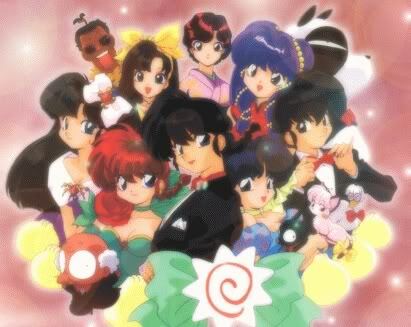 Unsuccessful upon first locating her target in Japan, she finds Ranma, this time a male, in the Tendo household—where she managed to enter courtesy of Kasumi, who thought Genma had invited her, when she was actually stalking him—and declares her intent to kill Akane for hiding female Ranma from her. Ranma stops her attack by kicking the ball off of her Chúi, which knocked her cold when it landed on her head, accidentally defeating her a second time. However, instead of receiving a "Kiss of Death," Ranma gets a kiss on the lips; it turns out that if a female Amazon is defeated by a male outsider, she has to marry him. She continues on the path of trying to marry male Ranma and kill female Ranma, until Ranma tricks her into thinking that the male side is a disguise for the female side. Heartbroken, Shampoo returns to China, where she undergoes re-training at the hands of her great-grandmother Cologne and finally receives a cat curse at Jusenkyo, which causes her father to become concerned. Realizing that Ranma had been cursed as well, she goes back to Japan with Cologne to try to marry him once more, learning in the process that he is actually male. History only shows when Shampoo was defeated, through the time of going to Japan. I would suggest it to have more history. Other than that, you've done an amazing job with everything else. Very detailed.